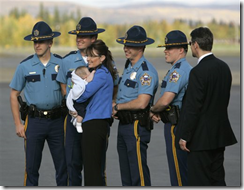 Palin Continues to Lie Re the Findings of the Troopergate Report - Does she think that we can't read? Since the report’s release, the McCain-Palin campaign has been in full spin mode. Campaign manager Rick Davis falsely claimed “there was absolutely no wrongdoing found in the report.” And when asked by a reporter if she abused her power, Palin dodged, saying “there’s nothing unlawful or unethical about replacing a cabinet member” — referring to her dismissal of Public Safety Commissioner Walter Monegan. But yesterday, during an interview with the local CBS affiliate in Pittsburgh, Palin stooped a little lower, stating flat out that the Legislative Council’s report had found that she did not abuse her power: Full article here. ANCHORAGE, Alaska — The Alaska Supreme Court will decide whether to block the findings of an abuse-of-power investigation due to be released next week that could be potentially damaging to Gov. Sarah Palin's vice presidential candidacy. The court accepted an emergency appeal late Friday filed by six Alaska lawmakers who claim the investigation is being manipulated to hurt Palin before Election Day on Nov. 4. The court scheduled oral arguments for Wednesday on whether to suppress the probe's findings. The independent investigator conducting the probe plans to turn over his conclusions by next Friday to the ...........Continue reading here. ANCHORAGE — When Gov. Sarah Palin meets Senator Joseph R. Biden Jr. on Thursday in the vice-presidential debate, even her fellow Alaskans might hear for the first time some of her views on health care reform, education policy and other issues of state government. Continue reading here. Ed O’Callaghan, erstwhile top terrorism prosecutor from Washington D.C., now holed up in Anchorage Alaska giving legal advice in the Troopergate investigation, announced that the “First Dude” will not be cooperating. He will ignore his subpoena, O’Callaghan says, because he no longer believes the investigation is “legitimate.” Why? Didn’t say. It must have something to do with that hideously partisan unanimous vote by a council of 8 Republicans and 4 Democrats. Continue reading here. MEETS TODAY: Failure to obey subpoena could bring charges. Todd Palin, the husband of vice-presidential candidate Sarah Palin, will not heed a subpoena to appear before an Alaska legislative committee this morning to testify about his role in Troopergate.Continue reading here. >>Lawyer Says Governor's Husband Objects To Probe, Finds Call To Testify "Unduly Burdensome"
(AP) Alaska Gov. Sarah Palin's husband has refused to testify in the investigation of his wife's alleged abuse of power, and key lawmakers said Thursday that uncooperative witnesses are effectively sidetracking the probe until after Election Day. Todd Palin, who participates in state business in person or by e-mail, was among 13 people subpoenaed by the Alaska Legislature. Palin's lawyer sent a letter to the lead investigator saying Palin objected to the probe and would not appear to testify on Friday.Continue reading here. ANCHORAGE, Alaska — The abuse of power investigation against Sarah Palin, Alaska governor and Republican vice presidential candidate, took a potentially ominous turn for her party on Friday when state lawmakers voted to subpoena her husband. Republican efforts to delay the probe until after the Nov. 4 election were thwarted when GOP State Sen. Charlie Huggins, who represents Palin's hometown of Wasilla, sided with Democrats. "Let's just get the facts on the table," said Huggins, who appeared in camouflage pants to vote during a break from moose hunting. Continue reading here. The state Senate Judiciary Committee voted 3-2 today to subpoena 13 people -- including the husband of Gov. Sarah Palin -- in an investigation of whether Palin abused her power in trying to get her former brother-in-law fired. Continue reading here.